Easter is one of my favorite holidays. I think it may even surpass Christmas for me. I love everything about it. It coordinates right along with spring time, and there is so much new life with the entire season. I just think it is egg-stravagant (see what I did there?). Easter took a whole new meaning for me when we had kids. I like making them their own little special Easter baskets with small goodies that are tailored for their interests. We don’t go overboard with Easter baskets. Since we are making four Easter baskets, the husband and I do have a budget for the basket items. 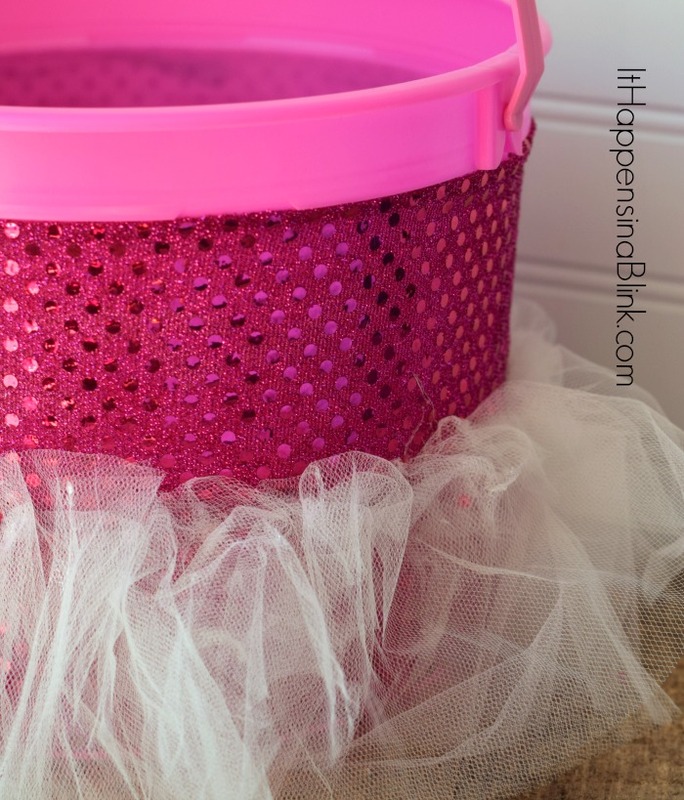 One way that I’ve found to save a bit of money is by turning inexpensive buckets into personalized baskets. 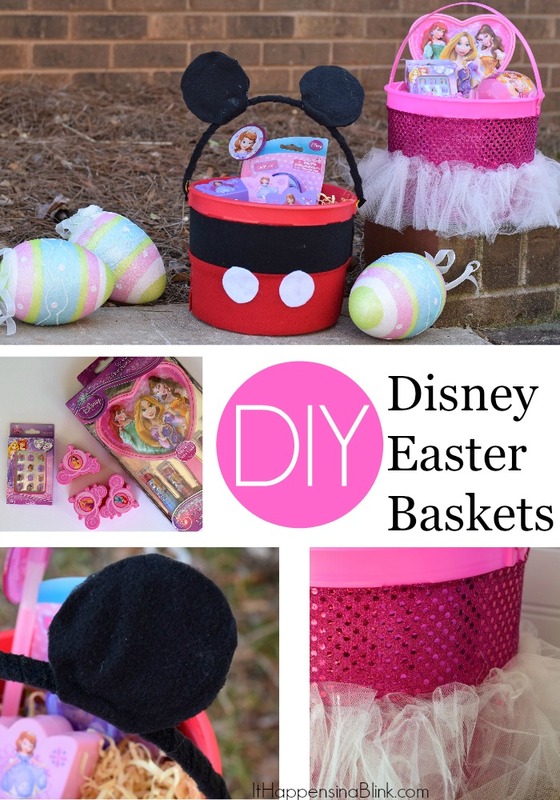 These DIY Disney Easter Baskets are this year’s creations. Let’s face it- what a kid likes changes from year to year. Buying expensive themed baskets may be lucrative, but I’m hesitant to throw around that kind of money for something that may only be appreciated once. 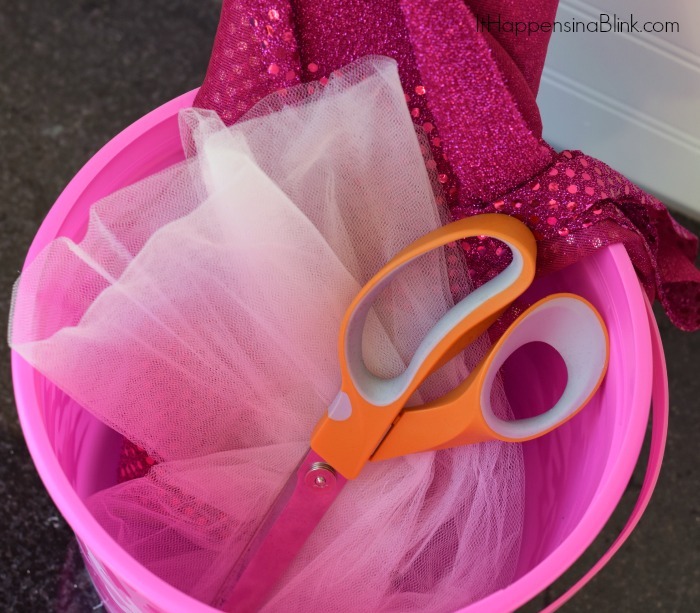 Instead, we use 99 cent buckets and a few supplies from my craft stash to create one of a kind baskets for each kiddo. 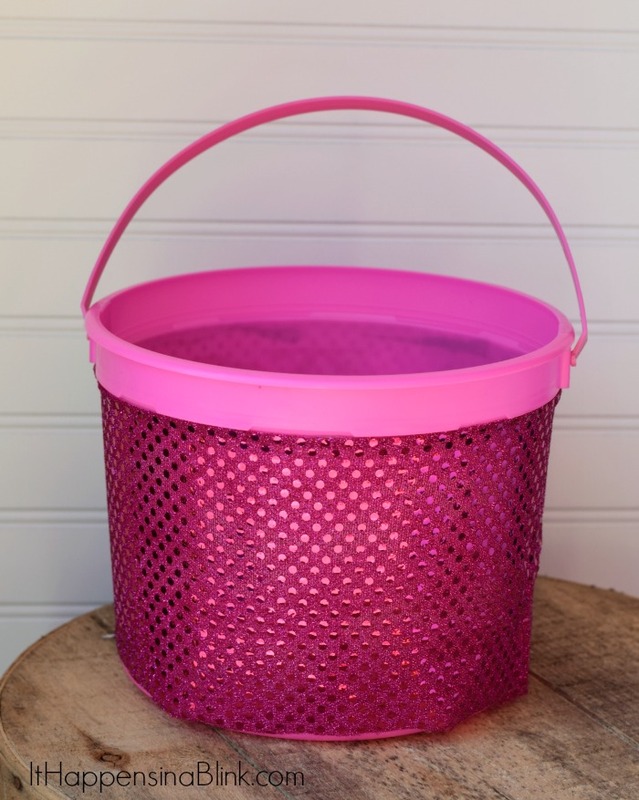 You may find that you already have a bucket around the house that would be perfect for this project! My daughter is currently obsessing over Disney Princesses, and the boys all adore Disney Junior. While their favorite show is Mickey Mouse, they’ve grown to be Sofia the First and Doc McStuffins fans, too. I found the items to stuff my DIY baskets at Walmart. 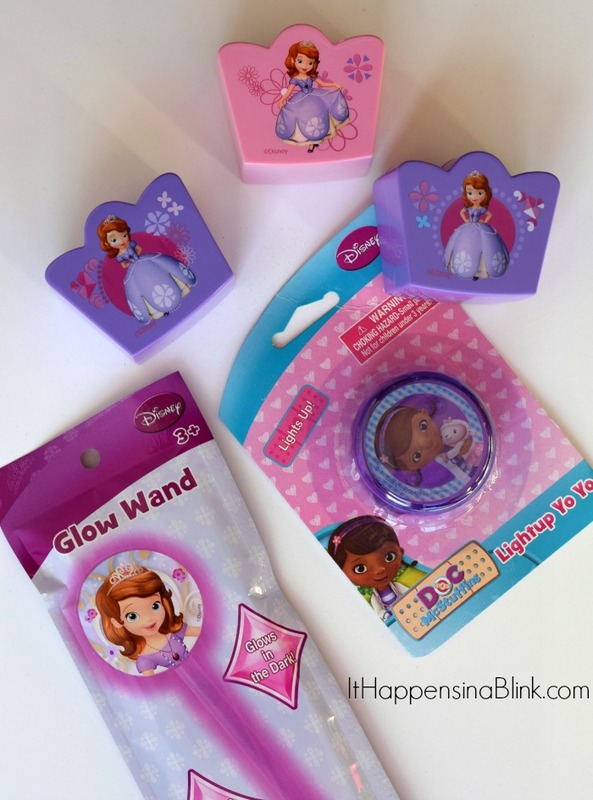 Walmart is currently carrying a line of Disney items that are perfect for any Disney lover! I located the selection in the seasonal Easter section. Now let’s make some baskets! 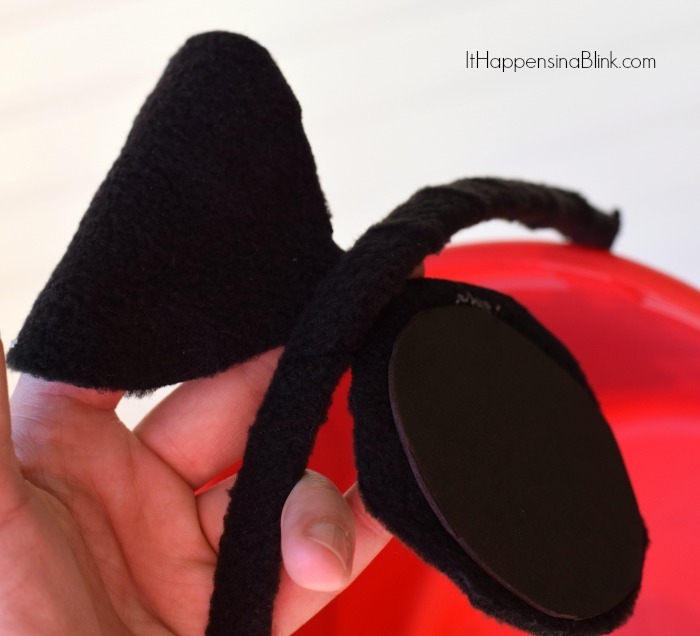 I’ll start with the DIY Mickey Mouse Easter basket. 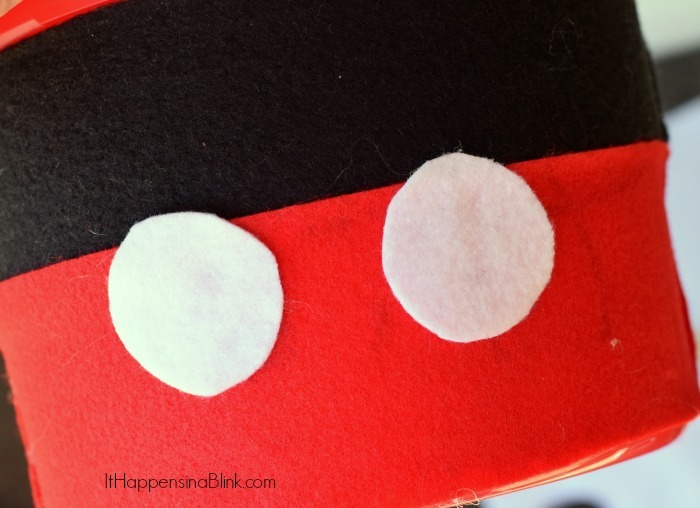 This can easily be changed to Minnie Mouse by using pink felt in place of the red and covering the pink with white polka dots. 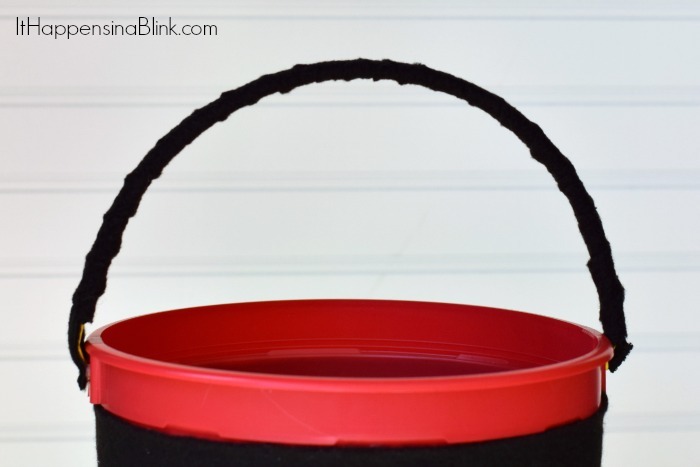 Cut a strip of black felt to cover a little less than half the bucket. Hot glue it into place. My bucket had a rim (yours probably will, too), and I began the felt underneath that rim. Cut a piece of red felt, and hot glue it around the bucket. 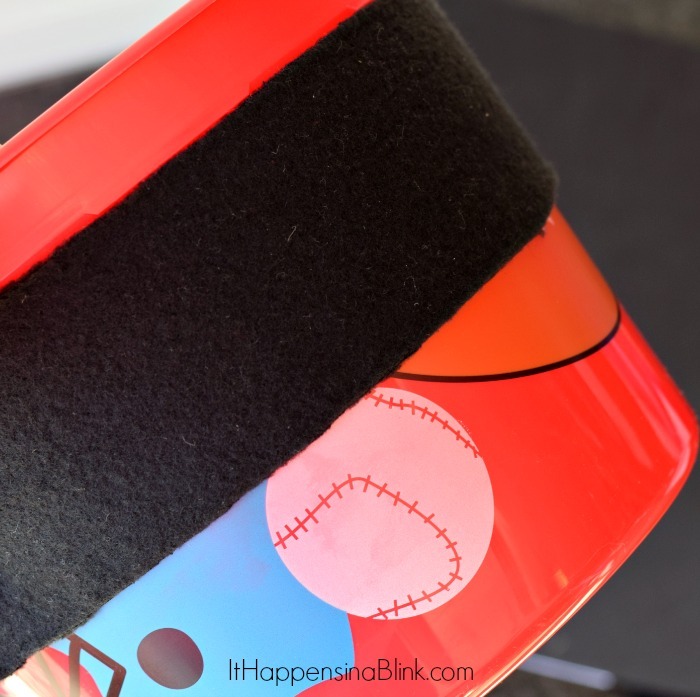 Overlap the black felt by about 1/4″ to guarantee complete coverage of the bucket. 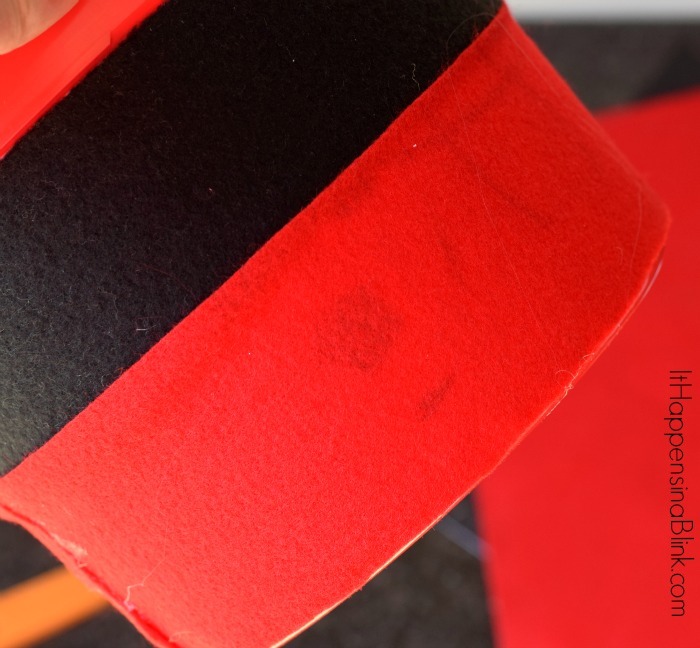 If you’re using red felt rectangles, it may take two cuts to cover the bucket. Cut two circles from the white felt. Hot glue them in place. Cut a strip of black felt. Wrap it around the bucket handle, and secure it with hot glue. 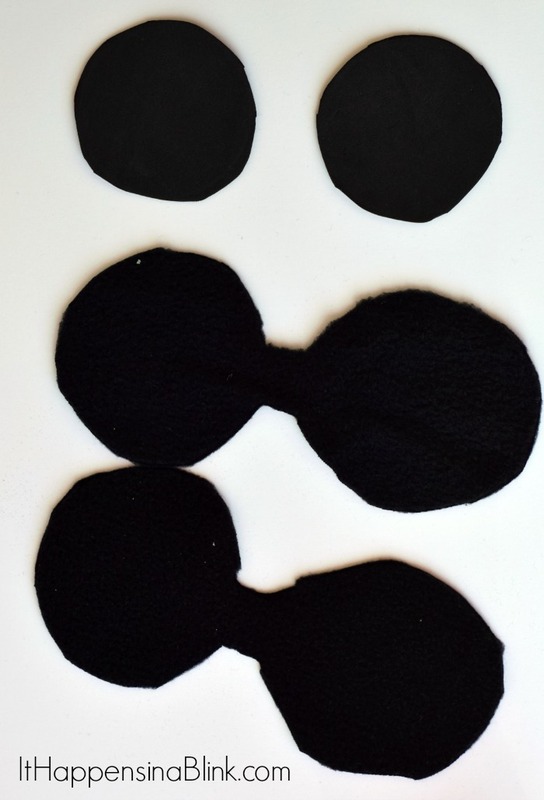 To make the ears, cut two pieces of black felt that look like a barbell. Cut two black foam circles that are slightly smaller than the inside of the barbell circles. 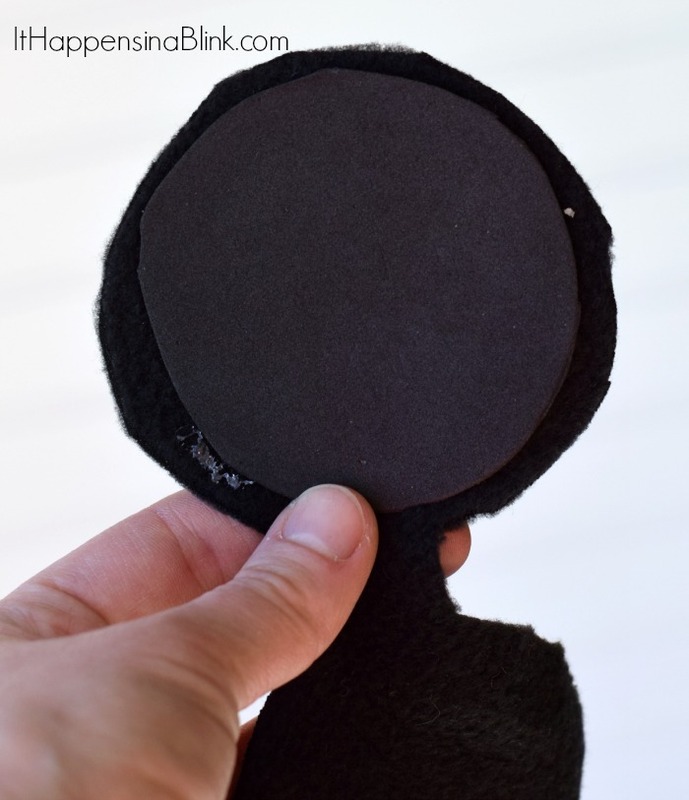 Hot glue one black foam circle inside one circle of each felt piece. Wrap the felt piece around the bucket handle where an ear would go. Hot glue in place. Repeat with other ear. 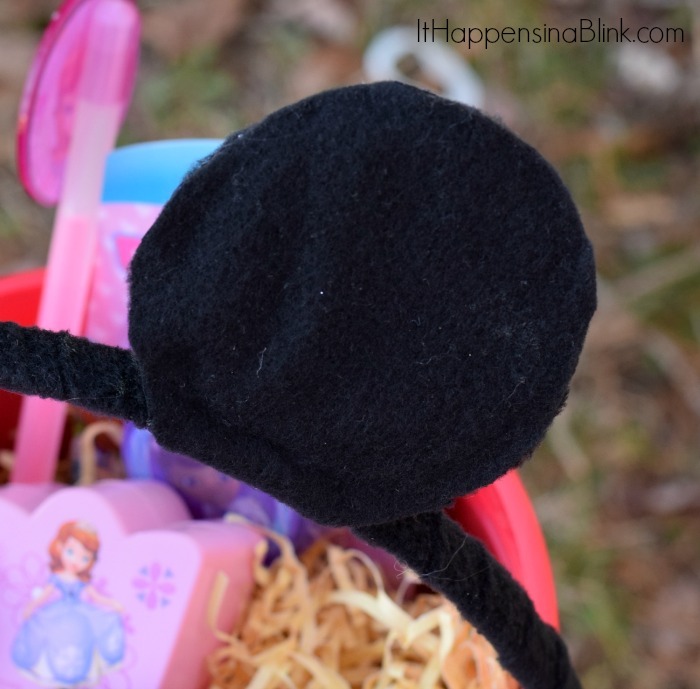 All that’s left is to fill the basket with grass and fun Disney Junior items! It’s a good thing these baskets are so quick and easy since I have to make three of them! But, for now, I’d better get to working on big sister’s Disney Princess themed basket. 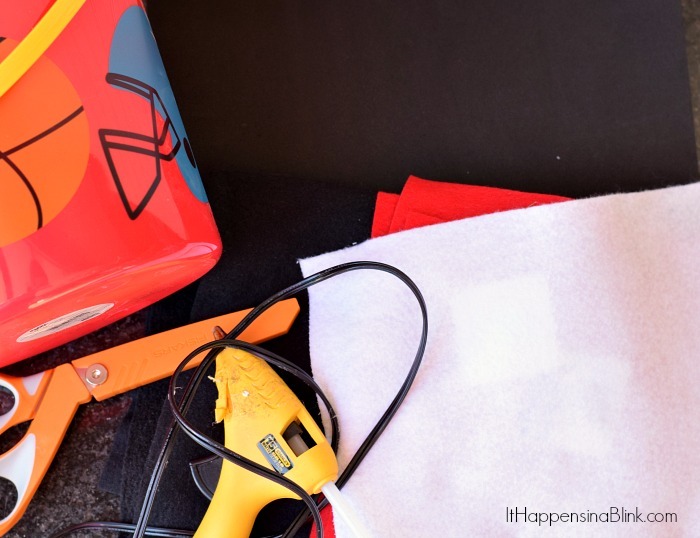 Wrap the bucket in the material, and hot glue in place. To create the tulle skirt, cut a long strip of tulle. I cut mine wide so that I could double it to create more fullness. The amount of fullness of the tulle skirt is dependent upon the length and width of the tulle material. There is no exact measurements for this. It’s really based upon preference and the size of the bucket that you are using. Carefully begin attaching the tulle to the basket with hot glue. Bunch the tulle up as you go to create full gathers. This step is the most tedious. It’s also the step where you’re almost guaranteed to get a few hot glue gun burns! 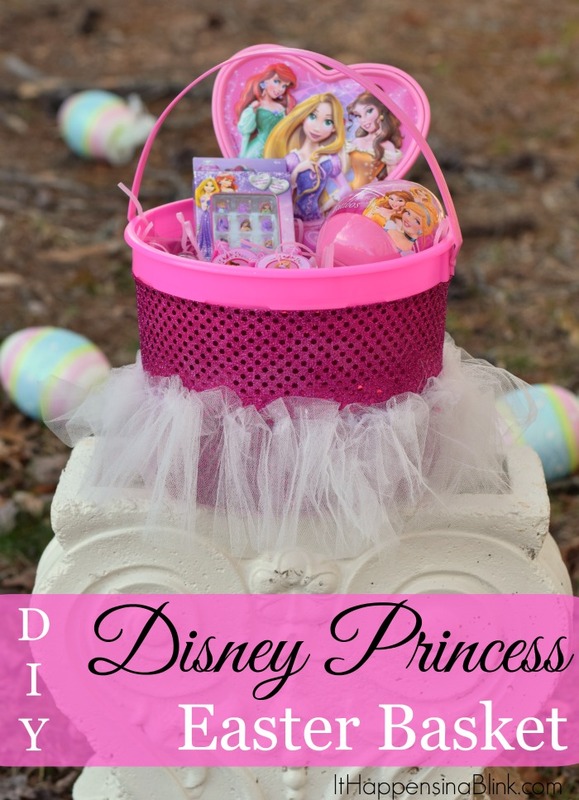 I filled the basket with Disney Princess items that my little one would be able to use to play princess dress-up. Here’s a quick step-by-step video of how quick and easy it is to make this basket! 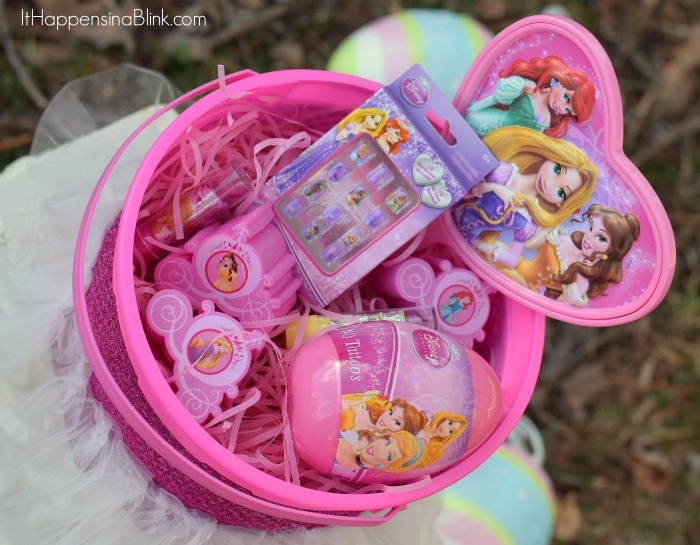 How do you personalize your child’s Easter basket? Do you have any money saving tips for simplifying the holiday? I love this idea of a DIY basket. My kids are older now, and don’t really get Easter baskets any longer, but before I know it, there will be grandkids and I will remember this idea! So creative! 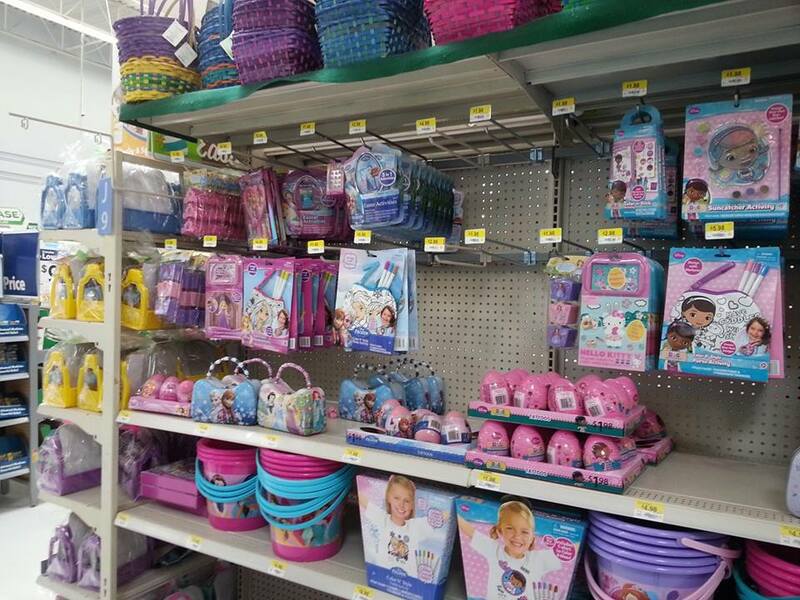 Oh those are such cool Easter baskets. If I were to do something like that, my kids would FREAK! So simple but so cool – I bet you’ll be using these for years! Thanks, Kristin! I can’t believe it either! These are adorable! Love them both! These baskets are so cute. We went to Disney for the first time this year so the kids are way into this kind of thing! Thanks for these ideas. Really cute ideas – I could see my kids loving both these ideas! So cute! I love the mouse ears. Pinned! 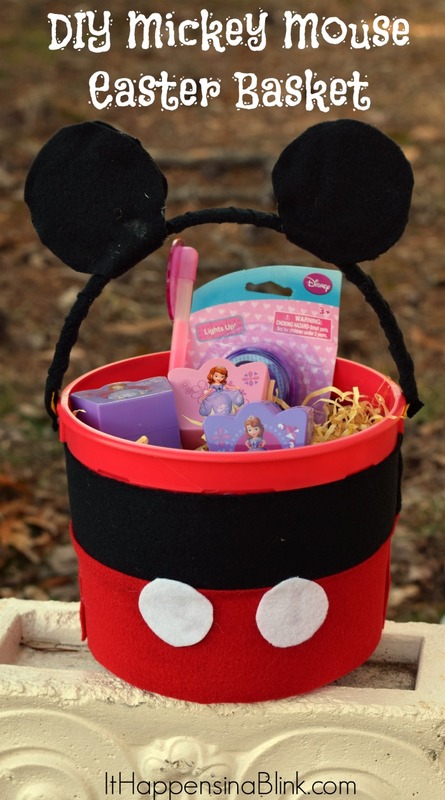 The Mickey Mouse one is definitely my favorite–he is a great basket because both boys and girls can enjoy it! OMG, these are darling. I love them so much!